Hydroforming is a technology that Inoxveneta has been using since 2009 to provide customers with sheets and tubes with special design, shapes and performance. It’s a cold-molding technology that uses a high pressure hydraulic fluid for transforming sheet metal and tubes fitted to a specially designed die. The thrust exercised by the fluid allows the metal to adhere to the sides of the die and so take on the required shape. 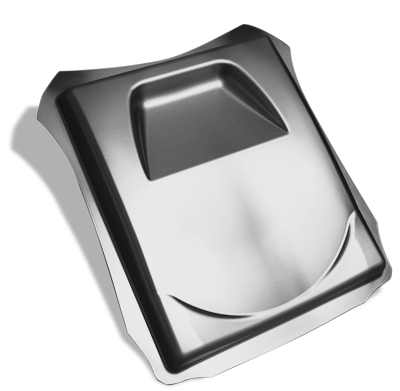 We dedicate great attention to developing processes and products with the aid of our engineers and, because hydroforming is normally included in an articulated production cycle, it’s essential to take into account every different steps before and after this process. There are several hydroforming technologies. In the case of sheet metal, Inoxveneta uses a particularly effective technique known as “water punching” where the final shape of the piece is determined by the matrix. The tubes hydroforming, however, requires that the tubes should be fitted into a specially shaped die and the high pressure fluid models the surface of the metal against the internal sides of the die to achieve the required shape. Possibility to make complex metal parts, with special curves, even with unusual shapes; sometimes shapes that would be impossible, or too expensive, to make them with conventional production processes. More creative freedom for planners and designers. Possibility to reduce the number of components in a product. Better mechanical and technological performance of products. Uniform material stretching and reduction of spring-back. Possibility of reduction of post-forming operations (holes, etc.). Overall savings arising from the lower cost of molds and auxiliary equipment.